Varsity football will play Benet Academy in their first conference game of the season tomorrow night under the lights on their home field at Triton College. The Shamrocks, with three straight home games to begin the 2018 season, defeated Taft 36-22 in their season opener and Glenbrook South 28-7 this past Saturday. Saint Patrick senior Jack O’Rourke, in his first season at QB, is a combined 18-34 with 217 yards and 2 TD’s in the first two games. 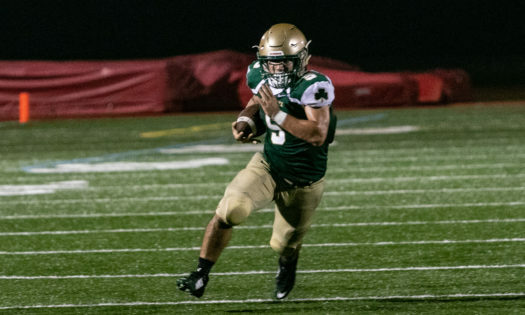 RB George Ohanessian ’19 leads the team with 36 carries, 183 yards and 4 TD’s and RB Eric Wozny, Jr. ‘20 has 18 carries, 147 yards and 1 TD. WR Giovanni Capifali ’19 has three TD’s including an interception against Taft. In addition, Coach Guerra has been happy with the play of LB Vince Waters ‘20, DL Kwame Achampong ‘20 and said DL Carl Reina ‘20 has added depth for the Shamrocks, particularly in the game vs. Glenbrook South. Xavier Saldana ‘19 and Capifali have gotten it done on both offense and defense and Ohanessian and Wozny, Jr. just need to keep running the ball hard. Kick-off is tomorrow night at 7:30 pm after the JV game at 5 pm at Triton College. It is also Youth Jersey Night. All youth athletes in their sports team jersey will receive free admission and in-game seating in the north end zone.